Hello everyone and Happy Holidays to you. It’s been a very busy fall season for me, between starting a new business and adjusting to a new life with Mom. The design industry in Houston is fully-charged, with (thankfully) a booming economy. So, I am staying busy creating lovely spaces for living and then, well, cooking. So, apologies for not being around lately. Seems like 24 hours is not enough in each day. The new year will bring with it more time with great friends, more fantastic meals with Mom, and hopefully more communication with you. I miss our conversations and hope to speak again soon. 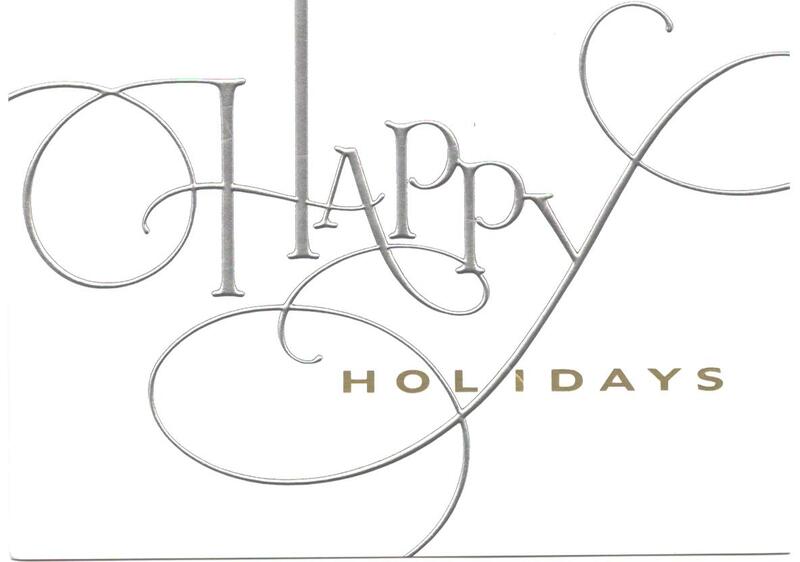 Until then, happy holidays to all of you our there in blog-land and may your new year be bright. Eat well, Love fully, and Laugh till it hurts! In Houston, there are some days that are so long and hot, that you don’t want to cook, at least with a lot of effort. Soup is one of my favorite things to satisfy the appetite after a long (hot) day. It’s usually light and you don’t have to eat much to feel full. 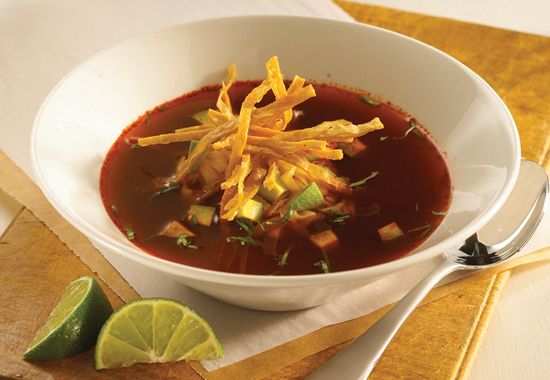 One of my favorites is Tortilla Soup. The best recipe I have found is from the Houston Junior League’s book, “Stop and Smell the Rosemary.” The recipe is the best and it’s easy to throw together. If your family needs more than “just soup”, grill up a quesadilla to serve along side the soup. This is a great way to use leftover roasted chicken, too. Heat oil in large pot over medium heat. Add onion and cook till softened. Add tortillas, garlic, and cilantro. Saute another 2 minutes. Stir in tomatoes with juice and turn heat to high. Add the cumin, chili powder, bay leaves and chicken stock. When about to be a full boil, turn down to just simmering. Cook for 20 minutes, uncovered. Turn off heat and add chicken and remove bay leaf. Stir until the chicken might be heated through. Add the freshly squeezed lime juice and stir one more time. If not ready to serve, just keep on very low heat and cover until your gang is ready. Ladle into bowls. Garnish with chopped avocado and a sprinkle of crumbled Queso Fresco. Add a sprig of cilantro if you want. P.S. As with all things seasonal, add other things, such as chiles, fresh corn, beans, etc as you like. This is merely a nice canvas to start with or plain and perfect as is. Think it would even be an easy and hearty thing to make for a crowd before Christmas Eve church service. Photo courtesy of Rick Bayless, king of all things Mexican, in my book. It’s a well-known fact that most any foodie’s first memories of really good food was from their mother’s (or grandmother’s) kitchen. AND, it was usually based on comfort food. For me, it was my mom’s meat loaf. When things were darkest and despair could only be lessened by food, meat loaf was made and served with mashed potatoes and green beans. It’s truly the trifecta of comfort foods. The meat loaf was always topped with a goopey glaze of ketchup, then with bacon. The consistency was light and had a crumbly texture in the cross-section. The potatoes were light and fluffy, even that they were laden with butter. She would insert a serving spoon into the potatoes, make a large scoop, and with the flick of the wrist, plop the perfect-sized portion onto a plate. The mound always had “stiff peaks”, like just-whipped cream. The green beans were always the fine French variety, skinny and small, and cooked till al dente. They were finished with a pat of butter, and a sprinkle of sea salt and freshly ground pepper. Do I have your attention yet? “Mom Food” is special to me. My parents knew it was a special boy-friend when he got to have my mother’s meat loaf. (Any time my mother cooks, I hoard the food, and dish out only to the chosen few.) So, without further adieu, I give you THE RECIPE. I feel that I’m doing us all a favor, by recording this for posterity. Serve with a Cabernet (is there any other way?). Run to the store and make this as soon as you can. Freeze the leftovers (ha). Make the glaze, mixing all ingredients in a small saucepan and set aside. Heat oven to 350F. Heat oil in medium skillet. Add onion and garlic and saute until softened, about 5 minutes. Set aside to cool, while preparing remaining ingredients. Turn meat mixture onto a foil-lined sheet pan. With wet hands, pat mixture into approximately 9” x 5” loaf shape. Brush with half the glaze, then arrange bacon slices, crosswise, over loaf, overlapping slightly and tucking bacon tip ends under the loaf (if necessary). Bake loaf until bacon is crisp and loaf registers 160F, about an hour. Cool at least 20 minutes. Simmer remaining glaze over medium heat until thickened slightly. 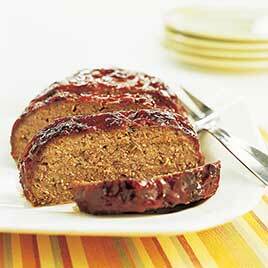 Slice meat loaf and serve with extra glaze on the side. *Note: this is not prepared in a loaf pan. It really does yield a nicer finished result, the sides and top crunchy since all exposed. Resist the inclination to use a loaf pan. You’ll be glad you did. Original recipe and photo courtesy of Cook’s Illustrated magazine (the best). It was the end of the first day of moving and I HAD to take a break from unpacking. It had been a long day. A bath, glass of wine, and “nothing” was calling my name. My second instinct? A movie. A foodie movie. A quality foodie movie that I hadn’t seen in a very long time, AND, one that would inspire me to do more than just open boxes. So, I chose “Julie & Julia”, a movie based on the book of the same name, by Julie Powell. 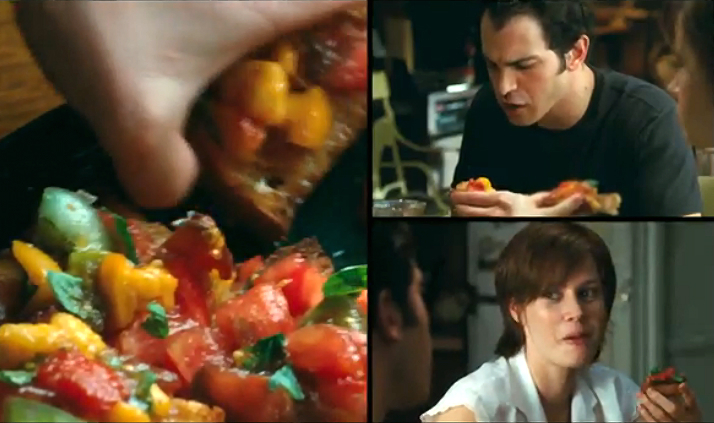 In the opening scene, she is making Bruschetta for her husband. As he eats, he devours one piece after the other, as if it was ambrosia. Ever since seeing that, I have been thinking about tomatoes and the fact that it’s summer and well, the sweetest time of year for tomatoes. In the spirit of all things “Julia”, and for my mom, I made the attempt last night. I found the freshest loaf of light and fluffy French bread and of course, yummy little sweet tomatoes. I served to my mother with a little Pinot Grigio and MANGIA! We were both in heaven. There were no words between us, but “yummy noises”, scraping up every bit that fell to our plates, as if every morsel was precious. Here is my version of Julie’s Bruschetta. It’s summer. Make this as soon as you can. It’s too hot to really eat, so make this at the end of a day when you’re feeling heavy and tired. 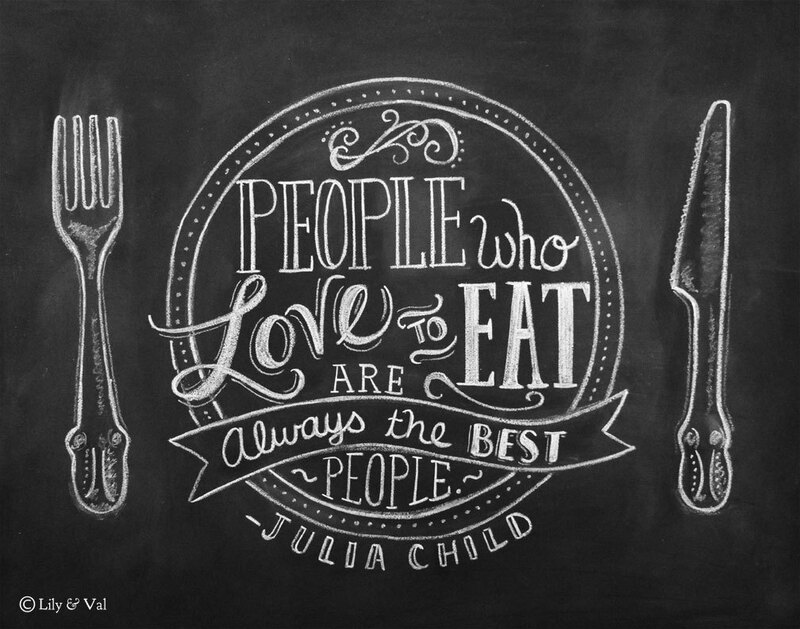 It will make you feel grateful to love food. Share it with someone you really like. In a large frying pan over medium heat, place enough olive oil to coat the bottom of the pan. Add the bread slices and fry until well-toasted. Remove from the pan to plates, cooked side up. Scrape the warm side with the clove of garlic (you can’t miss this step). In the same large frying pan, add a little more olive oil (if necessary). Add the bell pepper and cook till softened, 3-5 minutes. Add the tomatoes and salt and pepper to taste. Cook for about a minute. Add a splash of the white balsamic vinegar. Shake frying pan to blend and cook for about a minute, until the tomatoes start to soften and release juices. Turn off the heat, tear the basil leaves, throwing them into the tomato mixture. Toss one last time. With a large spoon, ladle over each piece of bread till all the mixture is used. Garnish with Parmesan cheese shavings. It’s been a while since I have written. Life has been full lately. My dining out and blogging have come to a complete stop. My 87 year old mother recently moved in with me. She is the one who taught me that cooking was something you did to serve the family. It should be good, hearty, and nutritious. It should always be appetizing on a plate. Her largest influence was Julia Child. I used to spend hours in the kitchen watching her cook. My father was not much of an adventuresome eater, but that didn’t discourage her. When he wanted liver and onions, she made the two of us fish, usually with a butter sauce. We always had a green salad (usually Ice Berg), a meat, a starch, a vegetable, and usually a dinner roll with butter. It was a well-rounded meal. Usually there was a home-made cookie (or two) for dessert, but never cakes or pies. She was a cookie baker. Large bunt cake tins usually rested at one end of the kitchen counter. Once you entered through the back door, it was easy to graze the tins for a little something, without spoiling your dinner. I used to see her watch Julia Child on the local PBS station. She would save up her ironing till the show came on. I remember vividly, her trying many of her recipes. Both volumes of “Mastering the Art of French Cooking” rest on my bookshelf (just above my head as I write this), which are very tattered, spines broken, and pages well-dirtied from efforts in the kitchen. When I was 13, my mother declared that I was to start cooking. I would plan, shop, and cook a meal once a month, and she would clean. My first recipe was Julia Child’s “Champagne Chicken”, which, I remember, turned out rather well, to the surprise of both my parents. I embraced my errors and strange creations, knowing that a life of cooking was in my path. By the time I reached college, I was a fairly accomplished and daring cook, which of course, appealed to boys, who came over for the latest concoction. 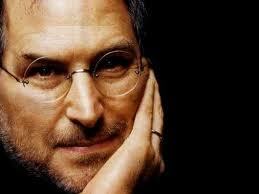 After I was married, I began to cook even more and with more passion, having dinner parties often. Cook the pasta as above and drain well. Cook the bacon as above. Set both aside while you make the sauce. Melt the butter over medium heat. Add the flour and whisk for a couple of minutes. Add the milk and whisk. Allow to come to nearly a boil and turn off the heat (if you have an electric stove). If you have a gas stove, bring flame to low after the milk starts to nearly boil. Allow the sauce to thicken. Once the right consistency is yielded, add the grated cheese and pinch of salt. Pull off the heat (or turn off the flame). Fold in the cooked pasta and bacon bits till well-incorporated. Fold half into each ramequin. Top with some blue-cheese sprinkles and some panko crumbs. Lay on a sheet pan and set into the preheated oven. Cook until hot and bubbly, about 25-30 minutes. It’s no secret (at least to Houstonians) that Houston is becoming a destination city for culinary arts. When my parents first moved here in the late 50’s, good restaurants were opening, and have become Houston’s “Old Guard”, some of which still exist today. Even if they have closed, they passed along a legacy of first-rate food to their children, who have opened wonderful eateries here and beyond. Most recently, I was able to enjoy a wonderful dinner with one of my favorite foodie friends, at Underbelly, which could only be described as AMAZING(!). The chef/owner Chris Shepherd emphasizes the use of local merchants and agricultural products. The menu is punctuated with seasonal produce, freshly caught local seafood, and grass-fed beef. To show his love for butchery, there is a window in the corner of the restaurant, which shows beef hanging and ready for butchering. We were able to steal a few precious moments from the General Manager, Matthew Pridgen. 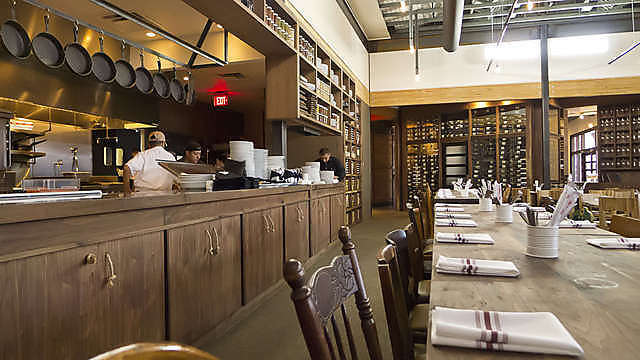 Matthew grew up on a farm, but has spent quite a while in Houston, as part of well-known places as Mark’s and Catalan. 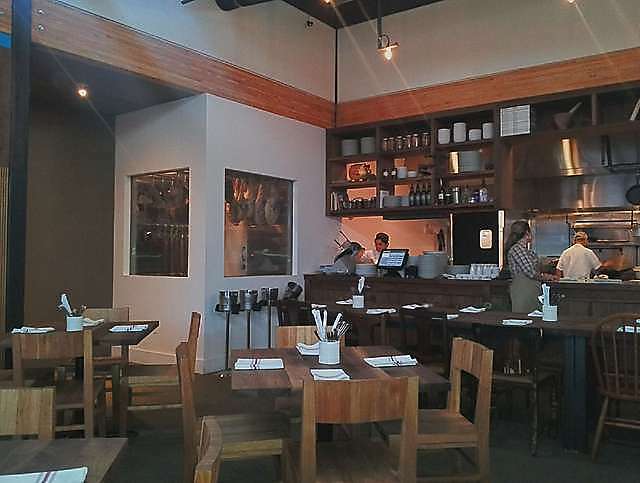 The restaurant is located in lower-Westheimer, near Montrose, in one of Houston’s original buildings, which has been wonderfully preserved and repurposed. Working with designers from Collaborative Projects, they were able to keep the building as close to the original as possible. As you enter, there is a gallery of photos taken by local artists. The style of the interiors is barn-like in scale, yet very cozy, with an open dining concept, so that guests may see the kitchen in action. In the center of the dining area are two very long communal tables, where diners can sit and visit more intimately with other diners. We were able to sit at the communal table, flanked on both sides with groups of business men, making deals and talking shop. While the table is large and deep, I still felt a strong sense of intimacy with my dining partner. We were able to sample many dishes, between many courses. In our typical style, we became acquainted with the waitress, and asked her to bring us many small courses to share, while keeping the courses secret, until presentation. We started with a dish of blood orange sausage, then had amazing roasted brussels sprouts (in fact, we had TWO portions they were so good). For our entree, we shared, what has been voted the #1 entree in Houston, which is the Korean braised goat with dumplings. Oh, it was heavenly. The meat was pulled and flavorful and the dumplings light, like gnocchi. The sauce was tomato-y, but also spicy. It was comfort in a dish! We ended with Beet Panna Cotta. Now, I would never think that beets should make their way into a dessert, but the flavor was rich, not too sweet, and a lovely color. Of course, we washed all of that down with some quality red. I look forward to going back again and again, and sampling whatever the wait staff brings us. The atmosphere is warm and charming and a perfect place for old friends to dine, or to bring business associates. As part-owners of the bar, Anvil, you might also try some of their very interesting aperitifs before dinner. Hello Everyone: Many of you have asked about why I haven’t blogged lately. The answer is really simple. I have made positive changes in my life to make room for the creative juices to flow. I feel inspired again and ready to share good restaurant experiences, recipes, techniques, and let’s not forget cool spaces. The thing I am most excited about is blogging about great restaurants and how the interiors affect the experience of the diner, bringing food and design together. So, today, I was hungry for soup with salad, so I made the following recipe. I took my inspiration from the Smitten Kitten, which you can see HERE. I am pairing this with a kale salad with ginger lemon vinaigrette, so I kept the soup pretty pure and simple. Feel free to add lemon, curry powder, chili powder, tahini, or whatever else you think would compliment it. Heck, keep it thick and call it Carrot Hummus, serving with pita. Preheat oven to 350F. In a large bowl, add all the vegetables. Drizzle with olive oil, salt and pepper. Toss well with fingers. Roast on a sheet pan with parchment paper (for easy clean up) for an hour, at least. Check the carrots and remove when fork tender (you may need longer to cook, depending on the size of your carrots). Remove from the oven and allow to cool. Put some roasted garbanzo beans aside for garnish. Add to blender. I have a VitaMix, which will puree anything (even relatives you don’t like). If you have a standard blender, you may have to do this in batches. Add chicken stock until you have arrived at a FINE puree. If you like it coarse, that’s fine. Serve with garnish of roasted garboazo beans and parsley. Drizzle with sour cream or Greek yogurt (if you like). It’s a great canvas for so many things. School just started back and we are all looking at the fall calendars and scheming and scheduling. Pretty soon, we will start talking about holiday parties (eek). BUT, not to wander to that just yet. This is (nearly) the harvest season, and root veggies are on my mind. One of my favorite meals is a simply roasted chicken and what a great way to roast veggies alongside the bird, to collect juices, and become carmelized. We usually think of the usual root veggies, like carrots, potatoes, but there are so many more to consider. There are several types of root vegetables: the taproot and the tuberous root, and their sister, the bulb root vegetable. Taproot vegetables grow downward. A center forms from which other roots sprout. Think of it like tendrils. Often times, the top is plucked, but the root stays in the ground. The plant may sustain many harvests, but then the root system becomes old and yields less fruit. Typical taproot vegetables are beets, carrots, dandelion, parsley, parsnips, radish, rutabaga, salsify, and turnips. The Tuberous root vegetables grow more near to the soil’s surface. With tuberous plants, underground plants form and not only grow vegetables, but the core plant continues to grow and can therefore last through winter, and for a long time. 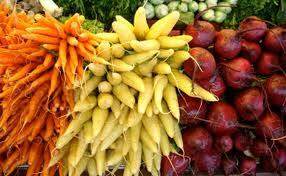 Good examples of tuberous root vegetables are potatoes, sweet potato, ginger, and yam. Ah, but there’s more! There are also bulb root vegetables. These grow underground, and are grown on the underside of the stem of the plant. The leaves of the plant serve as nutrition during dormancy. Examples of bulb root vegetables are garlic, onion, shallot, and fennel. So, think outside the box with root veggies. Next time you roast a chicken, put some new kinds of root vegetables in the roasting pan. Hello, Fall! When I was young and going out on my own, my mother advised me to always have certain ingredients in my pantry and fridge. “Even when you don’t have two nickels to rub together, you will still have something that is hearty, healthy, and soulful,” she would say. Since then, nearly 25 years ago, I have always had onion, celery, carrot, and lentils in my pantry. Now that I am older and wiser, I now make what I call “Soul Soup” nearly weekly, but I tweak it each time, so that it’s a little different. I serve with some kind of bread on the side. I like that it’s more of a stew than a soup, chunky and hardy. It will keep in the fridge and after a long and taxing weekday, it settles in the stomach and readies you for a good sleep. Here is my basic recipe. Sometimes, I add a little curry, use red instead of green lentils, add bacon or sausage, fresh herbs, pesto, chiles, chimichurri, cold cucumber for garnish. I invite you to create your own soul soup, to feed your friends, family, or aging parents. It costs next to nothing to make, but the heart that makes is what gives it soul. Optional: bacon, sausage, herbs, garlic, bay leaf, old rind of parmesan cheese, squashes of all types, pesto, and/or anything else you think would be good. In a big soup pot (dutch oven), heat pot over medium high heat. Add olive oil, diced onion, carrot, and celery. Cook until onion is soft and transparent 10-12 minutes. Add can of tomatoes and turn up heat to high. Add the lentils and liquid (stock or water). Stir well. Bring to a near boil (surface of soup starts to agitate), then turn to medium-low. Cover. 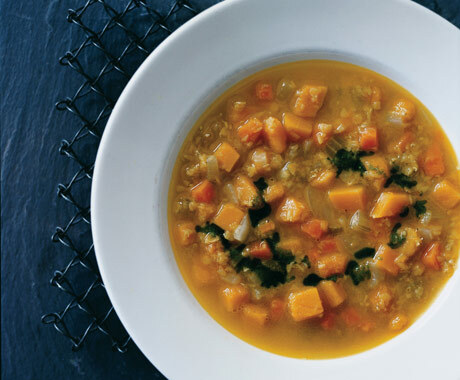 If using red lentils, cook for about 20 minutes. If using green lentils, cook for about 30 minutes (then check as may need a little more time). Green lentils should be whole, but soft to the tooth. 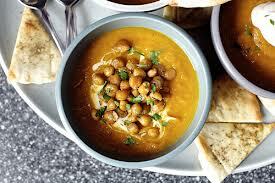 Red lentils tend to fall apart, since they are smaller and will therefore render a thicker soup. Let me know how you make out. Add this to your weekly regime. Your family will love it. It’s a great way to get good veggies into your kids if they are hard to please. Your stomach and soul will thank you. Photo courtesy of epicurious.com, my favorite site for food knowledge-base, menus, and recipes.